Although there is a wide range of closures available ,the conventional bore sealing has, to date, been the most widely used method of sealing containers. Bore seals are inexpensive to manufacture and are relatively easy to fit. However, bore seals are do not form hermetic, flexible or even reliable seals- they leak. There are three types of closures available, which are either inserted into the neck of or form a combination of two. The effectiveness of this seal can be affected by temperature, natural relaxation & mechanical properties, all of which will cause seal to leak, especially in transit. Automatic induction cap sealing machine is designed for rapid and reliable performance. When performance and system control are crucial to your operation, then this is the equipment for you. It has a touch screen input and controller for high tech sealing operation especially suitable in pharmaceutical applications. The induction cap sealer meets all the required industry requirements and therefore recommended for other industries such as food, beverage, cosmetics, oil packaging and chemical manufacturing industries. This equipment can be used for both low production as well as high production runs making it among the best equipments for industries with a wide range of products for packaging. The equipment produces the best hermetic oxygen barrier that ultimately extends the shelf life of the product with no possibility of leakages or seal damage. Tamper Proof : It is not possible, from production to the Consumer that the content of the product be manipulated without being clearly noticed. Product Freshness : The taste and aroma of the product remains intact due to the hermatic seal. Protection against Leakage : There is no spillage or loss of contents of the product. Sales Promotion : The foil on the inside can be used for advertising or promotional purposes. Maximum Filling Speeds : The sealing takes place without any direct contact which allows full potential of the filling plant to be utilsed. Minimum Effort : The wad is put in the cap by the manufacturers. 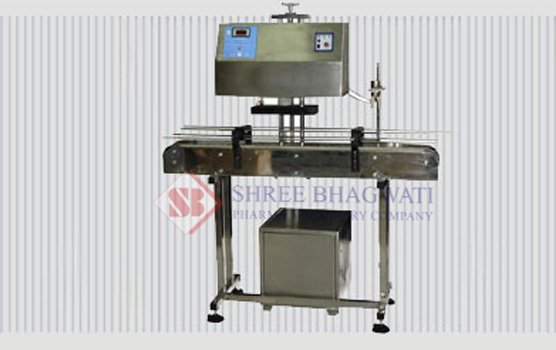 Thus the filling line requires only the Induction Cap Sealing machine to be installed. Indirect Heating : Induction heating allows heat sensitive products such as creams , petroluem product , pesticides etc. to be sealed faster and safely than direct heating which would normally spoil or catch fire. IGBT Technology : IGBT’s are more reliable and efficent at higher line speeds. We see a pulp board packing material as the retaining wad, the wax dot pattern layer , the aluminium foil and the sealing film. The lines of force radiate through the foil and induces current flow in it. This increases the temperature of the foil. Due to this , the sealing film melts and adheres to the lip of the container. After the seal is broken, the board or foam packing is retained by the cap. The process of Induction Cap Sealing is based on the principle that a conductive material i.e. Al Foil heats up on exposure to high frequency magenetic field generated by an Induction cap sealing machine. This is a non contact process without direct heat transfer.Due to this, the sealable closure liner can be placed in the cap by the manufacturer. The Wad consists of a board packing material, a wax layer, aluminium foil and a sealable film. The screw cap combination passes through the induction cap sealing unit after closure of the container.when the container is under the induction head, heat is developed into the aluminmium layer.The wax layer starts to melt and penetrates into the board layer.The Sealing layer also melt & forms a tight seal against the lip of container. The necessary pressure is provided by the liner/screw cap combination.On opening the container, the board remains inside the cap and serves as a seal on further use, whereas the aluminium foil is permanently sealed on the rim of the mouth of container. Innerseal can be used on containers made of PET,PVC,Polythene,Glass and other thermoplastics.They are suitable for use with screw type Snap On,Child resistant and other customer closures as long as the seal is in positive contact with the neck of container. A uniform neck finishing is required for good Induction Sealing.The sealing are not to be very wide.The small 50 ml to the big 200.Its Drum having a neck size of 10 mm opening to the wide mouth of 120 mm can be Induction sealed.Induction Sealing liners for HDPE,LDPE,PET & PP in the different thickness locally available.